bl.uk > Online Gallery Home	> Online exhibitions	> Asia, Pacific and Africa Collections	> Byculla Church, Bombay. 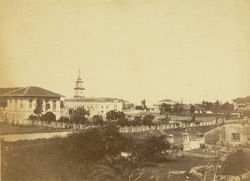 A photograph of Byculla Church, Bombay from the 'Vibart Collection of Views in South India' taken by an unknown photographer about 1855. Christ Church, Byculla (1835) has a Greek Doric portico using columns that were shipped from England. They were originally intended to be used for the Town Hall which was being built about this time, but on arrival were considered too large to be situated there.